(Dive Gallery) by friendly courtesy. There are about 500 cone shell species, all exclusively carnivorous. Most of them feed on marine worms and on other molluscs, including their smaller relatives and conspecifics. Those cone shells are referred to as molluscivorous. About 70 of the larger cone shell species on the other hand are piscivorous, they feed on small fish. 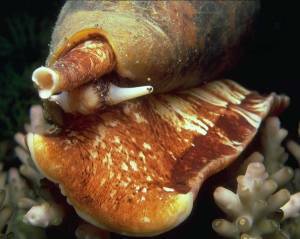 Cone shells, being gastropods, are much slower than their prey. They are only able to catch and eat it, because nature evolved a suitable hunting method - venom. The venom of some cone shell species paralyses and kills the victim in seconds. 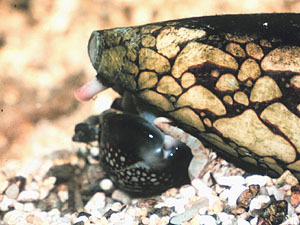 A cone shell's venom apparatus. harpoon during application. 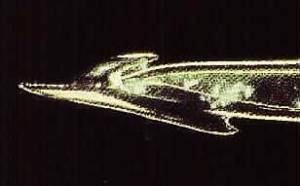 C: Close up illustration of a single venom harpoon. e: Sipho; f: Eye stalks (tentacles). Source: S. Frings and D. Grammig: Conotoxine - Muskelgifte der Kegelschnecken. Cone shell venom is applied by the radula teeth. We know the radula as the rasp tongue of the Roman snail and other terrestrial snails. But the cone shell's radula has changed very much during evolution. In contrary to other gastropods, that still have tens of thousands of toothlets on their radula, the cone shell only has one at a time. That, however, has evolved to a chitinous blade rolled together to form a barb-hooked hollow harpoon. At its inner end the harpoon tooth is connected to a venom gland. Additional replacement teeth are stacked in a sack-like organ at the radula's end. From here they are replaced, when one tooth has been expended. A cone shell's venom gland is long and shaped like a tube. During gastropods' evolution it has developed from a salivary gland. (Note: So has the venom gland of a blue ringed octopus, another venomous mollusc). Cone shell toxins are composed of oligopeptides, short-chained protein molecules. To avoid self-poisoning, a cone shell's venom is generated in various non-poisonous components that are stored in a safe way. Only shortly before application the components merge and build the effective nerve poison, the conotoxin. Through the proboscis, a cone shell's elongated snout, the harpoon is aimed and then stung into the prey's body. Through the hollow of the harpoon the venom is then injected into the victim's organism. tis). Source: James McVey, NOAA Sea Grant Program. Radula tooth of a cone shell. Source: Unterwasserbilder by D.
Conus purpurascens for example, a fish-eating cone shell species, lurks in ground on the ocean floor and uses its own breathing tube, the sipho, as a bait. Meanwhile, it can continuously observe its environment using olfactory receptors inside the sipho. A fish now going after the bait is attacked and subsequently killed by the gastropod. The venom causes first a cramping of locomotive musculature and later a complete paralysis of the fish, which the gastropod can now swallow without harm. As mentioned above, cone shell venoms are oligopeptides, protein molecules with short chains consisting of about 30 amino acid components. Additionally to this primary structure and the spatial secondary structure as a immediate result, disulfide bonds happen between sulphur containing rests of cysteine (cys) rests. Those disulfide bonds in the end decide about the definite spatial arrangement of a protein and thus about its effect, as a protein's effect is a direct result of its spatial arrangement, that may however change due to external factors like temperature, pH, and other factors. Conotoxins, though, not only consist of one peptide, but of different components, each of them a peptide consisting of amino acids. Which is why the toxin of Conus purpurascens causes first a hyper tension, cramping muscles, and afterwards a complete paralysis. According to their different effects, α-, μ-, ω-, κ- und δ-Conotoxins are differentiated. 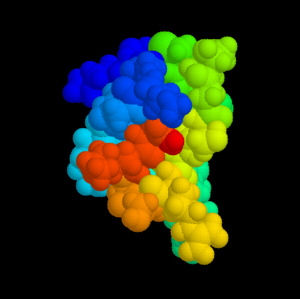 the peptide are coloured differently. Source: Cone Shells and Conotoxins. To better understand how conotoxins work, one must bring in mind the fact that information in a nerve cell is transported as action potential (AP). Action potentials form when a change in the electric charge of the cell membrane happens by a depolarisation. Depolarisation happens due to the action of ion channels changing the concentration of Na+- and K+-ions inside and outside of the membrane. Sodium channels then pump sodium ions from outside in, potassium channels in contrary pumping potassium ions from inside out. δ-conotoxins bind to sodium channels and inhibit them, and so do κ-conotoxins to potassium channels. The two most important ion channels not working anymore, there are no more APs and therefore no more nervous signals transmitted. Depending on the role of the nerve cell (it may be inhibitory or excitatory) the result will be hyperactivity (cramping) or paralysis of the muscle involved. Synapses link one nerve cell (neuron) to another (interneural synapses), as well as one nerve cell to a muscle (motoric end plate). At a synapse the electrical information of the AP is changed into a chemical information that can traverse the synaptic gap between two neurons or between neuron and muscle. The incoming AP causes an inflow of Ca2+-ions, which triggers production of acetylic choline, a neurotransmitter. Acetylic choline binds to a receptor on the other side of the synaptic gap and thus triggers an inflow of Na+-ions. Which in the end leads to a new AP, and that without any loss. ω-conotoxins stop the Ca2+-ion inflow by shutting down the respective channels. α-conotoxins on the other hand inhibit the binding of acetylic choline to the postsynaptic membrane and so stop the new AP from forming. Conotoxins, because of their intricate composition, are highly specific in their effect. If biochemistry manages to isolate single conotoxins according to their effect, single nervous actions can be treated and special pain symptoms could be reduced. In the Vienna General Hospital (AKH) as well as in various hospitals in the USA research is done in the field of conotoxins as pain killers. Conotoxins' advantage seems to be, that they do not lead to addiction (in contrary to morphine based drugs), they have relatively little side effects and they are highly specific. A possible field of application could thus be chronic diseases. Cone Shells and Conotoxins: Dr. Bruce Livett, Biochemist at the University of Melbourne, Australia, reports about Australian cone shells and their venoms. Additionally the page provides lots of information regarding cone shells. Conotoxine - Muskelgifte der Kegelschnecken: Lecture script with anatomical basics, function and biochemistry of cone shell toxins. Kohno, T, Kim, J.I., Kobayashi, K., Kodera, Y., Maeda, T. and Sato, K. (1995) Three-dimensional structure in solution of the calcium channel blocker omega-conotoxin MVIIA. Biochemistry. 34: 10256-10265. Walls, J.G. : "Cone Shells - A Synopsis of the Living Conidae", 1979. Wilson, B.: "Australian Marine Shells", Vol. 2, 1994. *) Literature information most friendly provided by Peter Garn.